A dental implant is a small titanium post that is inserted into the jawbone and provides a “root” for the placement of a restoration that looks, feels and functions similar to a natural tooth. Implants are artificial replacements for natural tooth roots in the upper and lower jaws. A These “anchors” resemble miniature screws and are usually made from titanium, which is highly compatible with bone. They attach to the jawbone and gum tissue to become a stable base for replacement teeth, called crowns. A single-tooth implant requires a series of procedures and time for the implant to successfully anchor, or osseointegrate, into the jawbone. This can take several months before the crown can be attached. But, once the implant process is complete, you’ll enjoy a new smile for decades to come. 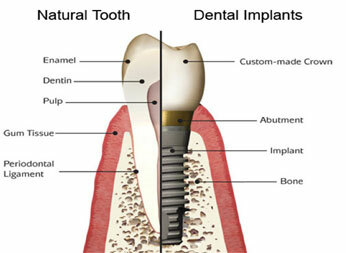 You may be a candidate if you are in good overall health, have healthy gums and adequate bone to support an implant. You must be committed to thorough oral hygiene and scheduling regular dental checkups.